Atheist Ireland has been reviewing hundreds of documents from ETBs around the country, as a result of our recent Freedom of Information requests. In many cases, we have found that ETB schools can be every bit as Catholic as those under the direct patronage of the Catholic Church. Aside from issues relating to fundamental rights, the tone of the communications between ETBs and the Catholic Church portrays some consistent attitudes. Specifically, representatives of the Catholic Church seem to be viewed with deference by the ETB sector. For example, Cavan and Monaghan ETB was created after the amalgamation of the Vocational Educational Committees in Cavan and Monaghan. At the inaugural meeting on the 3rd of July 2013, the Chairman set the tone for the new ETB organisation, by listing religion as the first core cultural identity of the two counties. Non-designated Community ETB Colleges are fully State-owned and fully State-managed schools. No religious denomination has any right to expect preferred treatment from such ETB schools, and no such schools have any duty or obligation to any particular denomination. For example, at their conference in Kilkenny this September, the ETBI accepted payments from two Scientology organisations in return for letting them operate stands to promote their material at the event. Presumably, the ETBI would have also have accepted payments from any other religious group that wished to promote their ideas in this way. However, the Catholic Church seems to have a view that they have special rights and privileges in ETB schools, with commensurate expectations. There seems to be no need for the Catholic Church to buy a stand at an ETBI Conference, if they wish to promote their ideas towards the ETB sector. For example, consider the tone of the letter below from a Catholic Diocesan Advisor to an ETB school principal, from 20th October 2015. How would the ETB sector respond to a letter like this from Atheist Ireland, or another religious denomination like the Scientologists at the ETBI Conference? If the ETBs would be less compliant to non-Catholic requests, on what basis would they be applying such religious discrimination? Recall that in principle, the Catholic Church has no more rights or entitlements in ETB schools than atheists or any other religious denomination (including the Scientologists paying to promote their ideas at the ETBI Conference). In practice though, from reading correspondence across the ETB sector, the entitled tone of the Catholic Church is matched by a deferential tone of ETBs towards representatives of that denomination. This stands in stark contrast to the tone adopted towards non-Catholic enquiries. Writing on behalf of the CEO (Mr John Kearney) a representative of CMETB responded on 1st December 2016, managing a full three sentences in their non-response. A representative of the Catholic Church has no more rights or entitlements with respect to the ETB Community Colleges, than anyone else. 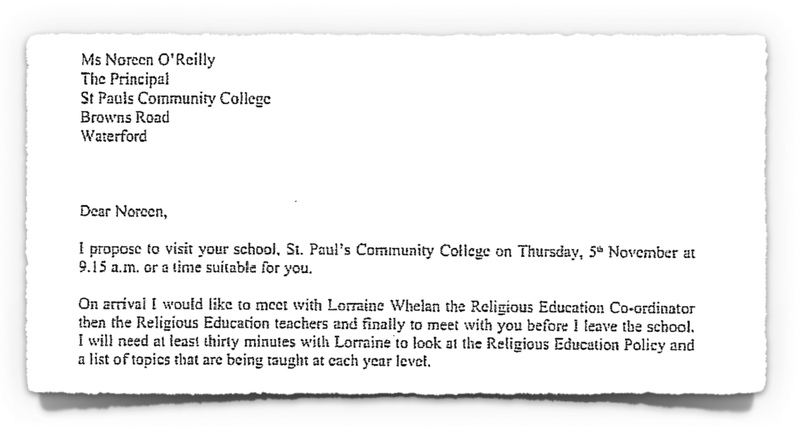 However, a Catholic Diocesan Advisor seems able to write to an ETB school with instructions as to when they should be received, and to give instructions on how religion should be taught. In essence the Diocesan Advisors behave in a manner that you would expect from the School Inspectorate. In contrast, if a non-religious parent asks a simple question about how religion is taught, they can only be told about unstated ongoing human rights concerns, which may possibly be resolved in unexplained ways and on undefined dates. If they were instead Catholic priests of the Dublin Diocese, they might find that the CEO of the local ETB was in fact reaching out to them. 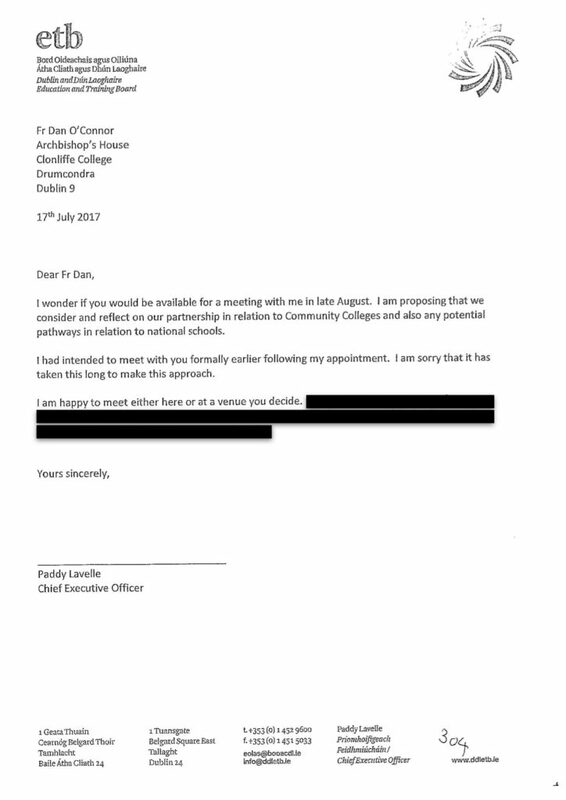 The letter below from the CEO of Dublin and Dun Laoghaire ETB, was sent to the Archbishop’s House on 17th July 2017. In fairness to Dublin and Dun Laoghaire ETB, they were the only ETB that provided FoI responses to Atheist Ireland at no charge, in the public interest. All of the other ETBs that were asked, demanded hundreds of euro in order to provide information, which in many cases should have already been in the public domain and freely available to parents. 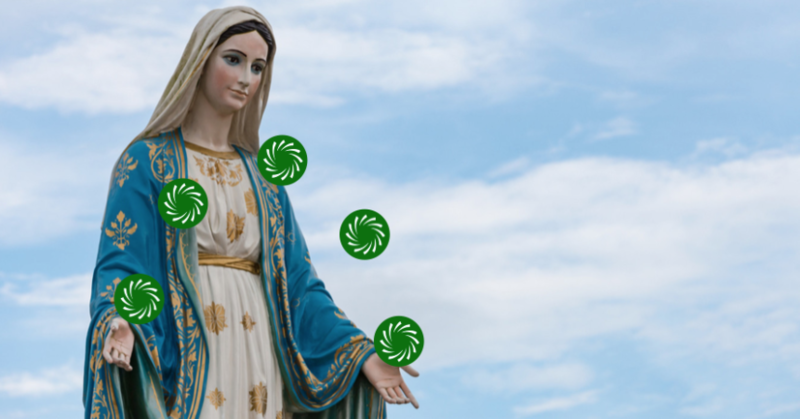 We might guess at whether or not the Catholic Church has encountered the same kind of difficulties in acquiring information from the ETB sector, as Atheist Ireland has.